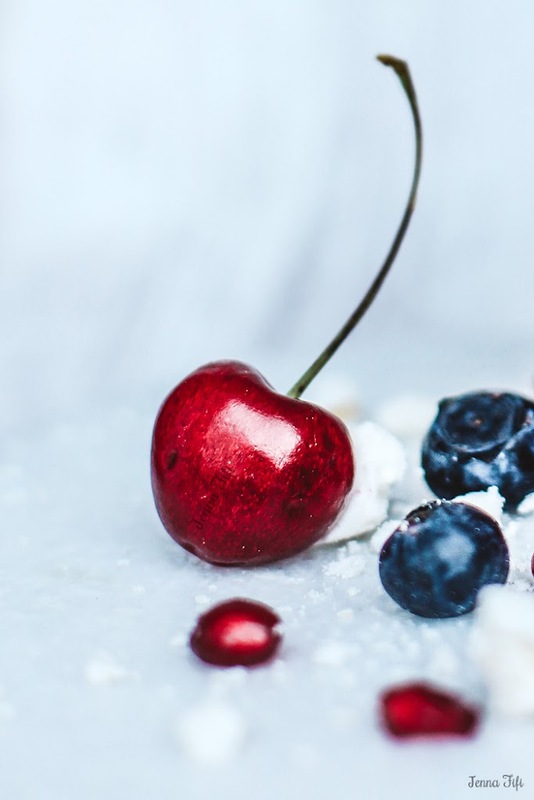 When I wrote my new years resolutions all those many months ago, there were two things on the list that I knew were going to clash; baking more cakes and eating healthier food. Running a cake business requires plenty of buttercream sampling and with each drizzle of salted caramel ganache, my goal for a healthier diet was quickly shrinking into the distance. It was a change of focus that ignited my passion for nutritious dishes. 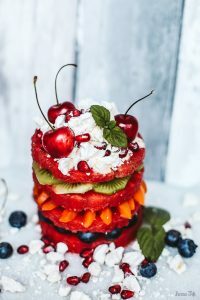 I decided to experiment with fruit and veggies through the same colourful, creative eyes that craft my sponge alternatives, and this recipe in particular takes all the theatrical qualities of a layer cake and turns them into a guilt free pleasure. I’ve been imagining this fruit salad cake for a while now. I wanted to create a healthy, light dessert that would be just as much of a show stopper as my other chocolaty creations. 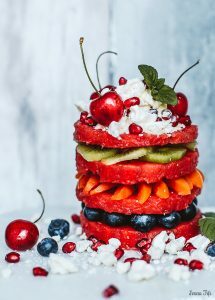 Whilst the watermelon covered in cream cheese frosting cake has been popping up all over Pinterest, I haven’t come across anything quite like this. There is no hidden surprise with this dessert, no disguise or false pretense. This looks exactly like what it is; a fresh, feel good, contemporary spin on a much loved classic. 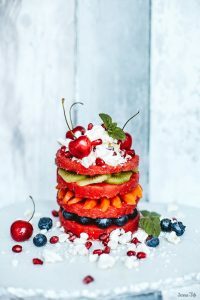 Inspired by bright fiesta colours and in the style of my own rustic, whimsical cakes, I give you my Summer Fruit Salad Layer Cake. AKA essentially what happens when a cake baker goes on a diet. 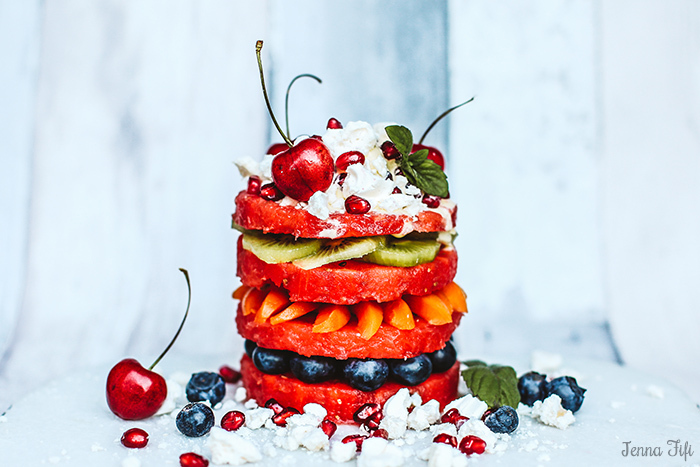 Watermelons are so refreshing and blend well with a multidude of fruits and flavours, they also make for brilliantly sturdy bases. I couldn’t resist adding a dollop of ice-cream, for old times sake, but this is of course optional. Ice-cream and meringue a-side, this dessert is ideal for anyone who has dietary restrictions. 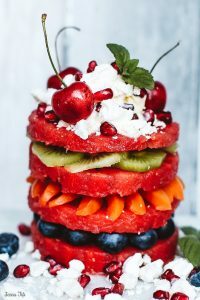 This is ridiculously easy to make (a darn sight easier then layers of sponge) and open to a variety of fruit combinations and toppings. This can be whipped up in less then 30 minutes, so it’s a perfect option for last minute summer BBQ’s. It’s also pretty much fool proof, especially if you embrace the clutter of free falling pomegranate seeds and avoid perfect uniformity. The more fun you have it, the more eye-catching it will be! Begin by cutting your watermelon into slices. This is best done on a chopping board with plenty of napkins at hand to soak up any juice. Slice the watermelon length ways and using a cutter, or a knife, carve each slice into even circles. 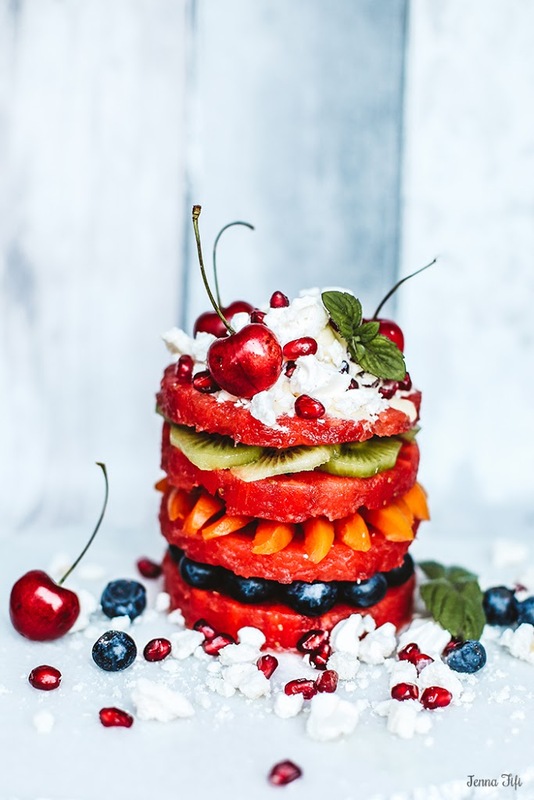 Next assemble your fruit layers, making sure each layer is level and even. Don’t be afraid to place a skewer through the centre to help keep it together. 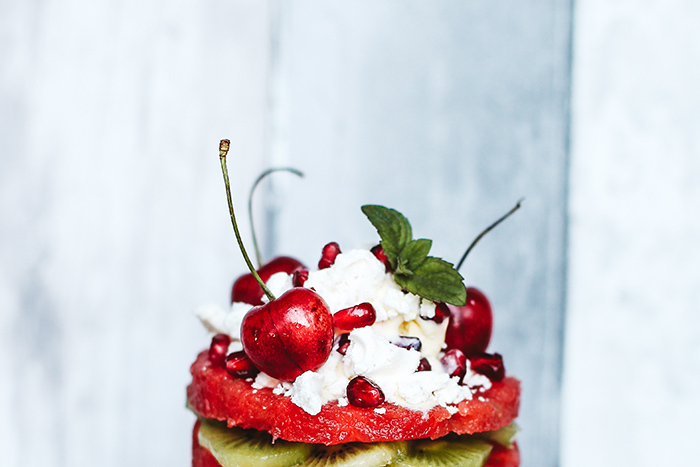 Place a dollop of ice-cream on top and liberally sprinkle crushed meringue and pommegantes. Garnish with cherries and mint. 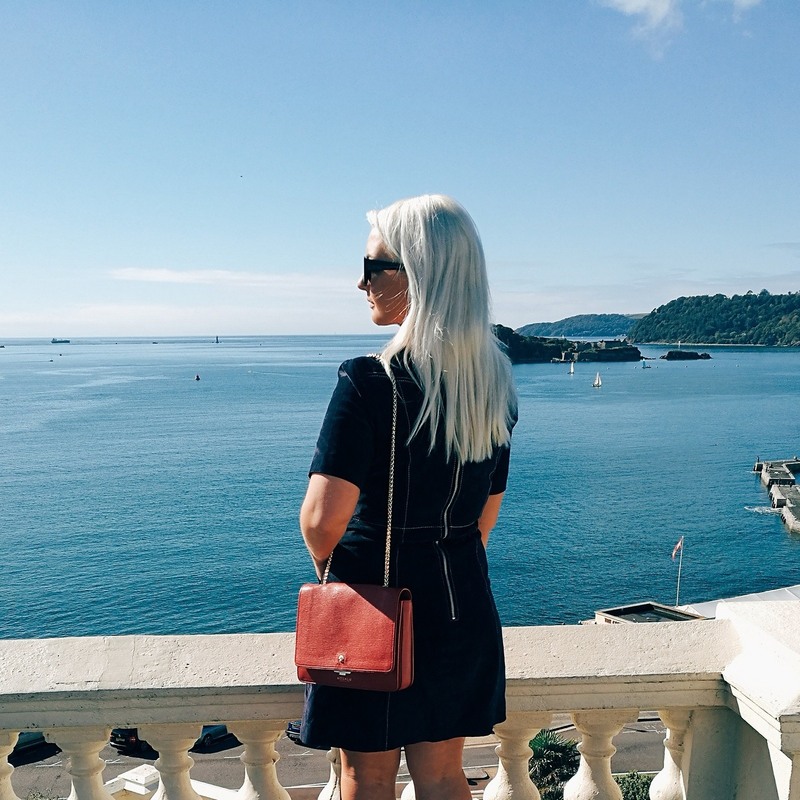 This is best enjoyed alfresco style with prosecco in hand and sunshine in abundance. 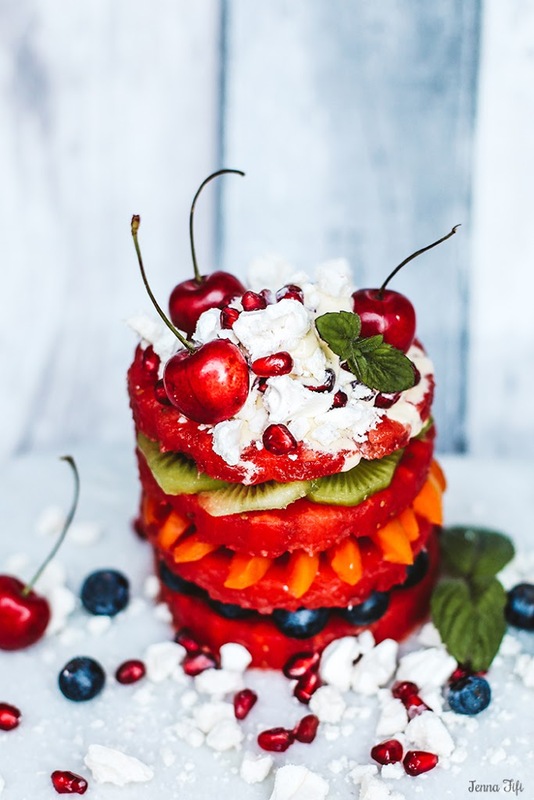 If you create your own Fruit Salad Layer Cake, don’t forget to tag me @jennafifi in your photos, I’d love to see them!